This is a very good night for Jerry Brown. In spite of Republican Meg Whitman spending more than $140 million of her own money to try and become the first female governor in California, the voters decided that experience was more important than touting being an outsider. Whitman was CEO of eBay and made the company a billion dollar company. But Brown exploited his experience that would make him an asset in dealing with the problems that California is facing. 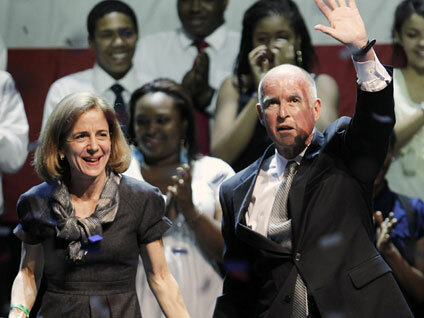 As a matter of fact, Brown would use his four decades in politics in California as a positive - he wouldn't have to learn on the job and he had the means to make government work - when he left the governor's office in 1984, he left a budget surplus. Besides governor, he was the state's Attorney General and Mayor of Oakland. The voters tried an outsider when they elected Arnold Schwarzenegger as governor, but he hasn't lived up to expectations. His job approval rating is hovering around 29 percent, close to the 24 percent that former governor Gray Davis had before he was recalled. It was a brutal campaign on both sides and when both candidates were asked if they would forego negative advertising, Whitman declined, which turned voters off. In addition, her campaign hit a road bump when her housekeeper was discovered to be an illegal immigrant. Whitman denied that she knew she was undocumented, but when she found out, she let her go immediately. However, it was shown that Whitman did know years before about her housekeeper's status, but only let her go when she began running for governor. This rankled the Latino community -while she was feverishly courting them with Spanish language billboards and ads on Spanish TV. Whitman said she would need to get at least 35 to 36 percent of the Latino vote in order to win the election. But this incident did not help. About 22 percent of the electorate is Latino and she almost reached her goal. In preliminary results, the CBS News exit poll shows that she got roughly three out of 10 Latino votes. Whitman wasn't the only one with a glitch in her campaign. One of Brown's aides called Whitman a whore in the context of excluding police and firefighters from her pension reform platform. She got their endorsements). Whites, as in the Senate race, support the Republican candidate, giving Whitman a 52 percent to Brown's 45 percent lead. Blacks make up about one in 10 voters and they overwhelmingly support Brown by 77 percent. Almost two-thirds of Latinos backed Brown. All age groups but those 65 and over support the Democratic candidate. All income groups except for those households with incomes of $100,000 or more support Brown. The wealthier voters supported Whitman. Interestingly about 27 percent are declined-to-states (independents) and they are supporting Whitman by seven points. In a 2006 CBS News exit poll, the DTS voters gave Schwarzenegger a 26 point advantage over his Democratic opponent - they were 25 percent of the electorate. If the voter believed government should do more to solve problems, 41 percent, most of them back Brown, while voters who believe government is doing too many things, 53 percent, a huge majority is supporting Whitman. More than half, 53 percent, of voters say that the one contest on the ballot that mattered most was the governor's race and they are supporting Brown over Whitman by 62 percent to 35 percent. 54 percent say they want an insider who knows how to get things done and 71 percent of this group supported Brown. The CBS News exit poll was conducted by Edison Research for the National Election Pool. Results are based on 3,814 voters in California interviewed either after exiting the polls across the state or by telephone for early voters. The poll has a margin of error of plus or minus two percentage points. Susan H. Pinkus is the former director of the Los Angeles Times Poll and now conducts public opinion research at her firm, S. H. Pinkus Research & Associates.